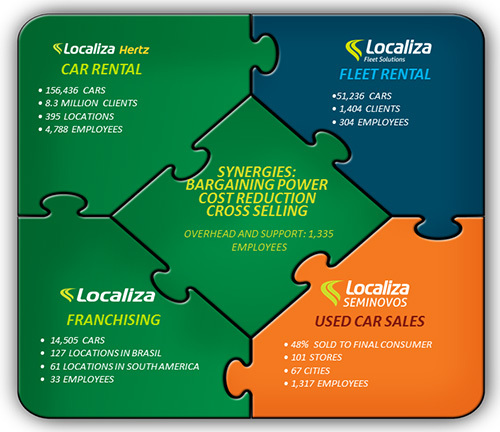 Localiza is the largest car rental network in South America in number of branches, its integrated platform is comprised by Car and Fleet Rental Divisions and an efficiency area responsible for selling the used cars – Seminovos. The Car Rental Division is responsible for renting cars in branches located in airports and off airport locations. Rentals are carried out by companies, individuals on business or leisure, ride-hailing drivers, as well by for insurance companies and automakers which offer replacement cars to their customers in the case of accidents or mechanical breakdowns during the term of the insurance policy or warranty, respectively. The Franchising area is responsible for franchising the Car Rental in Brazil and South America. The Fleet Rental Division outsources fleets to companies based on long-term contracts (usually 24 or 36 months). Its fleet is customized according to the needs and requests of its customers, thus being more diversified in terms of models, colors and brands than the fleet of the Car Rental Division. Due to the constant need for fleet renewal, Localiza disposes its used cars that are mostly sold directly to final consumers at stores intended for such sales called Seminovos. As a result, the Company maximizes the recovery value of such assets, reducing depreciation of the cars and the net investment in fleet renewal, since selling expenses incurred at its own car dealer chain is lower than the discounts required by resellers.